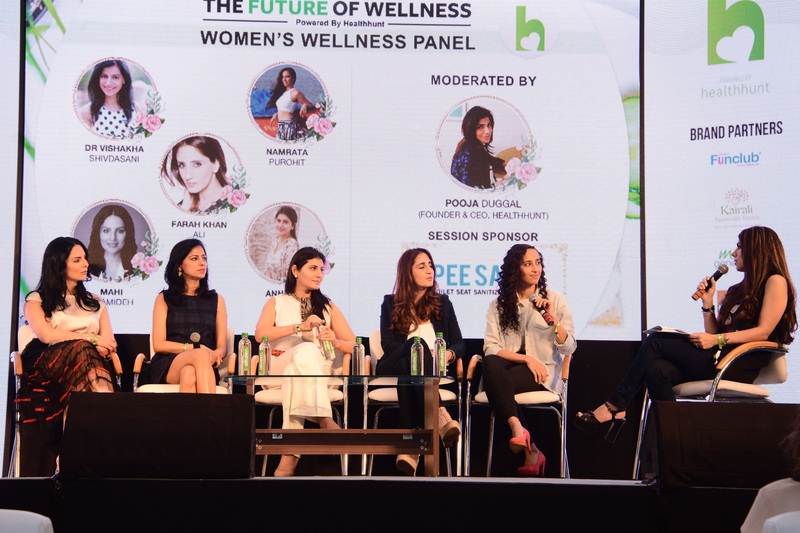 Healthhunt, an AI and deep analysis based SaaS online platform in the health and wellness sector, anchored the debut edition of India’s most premier wellness experience, the “Future of Wellness” at the World Trade Centre, Mumbai. The event witnessed a league of renowned celebrities & wellness experts from varied sectors sharing their insights on transforming the holistic wellness experience. FOW (Future of Wellness) observed a multitude of sessions and workshops and nearly 15000 participants and more than 100 brands showcasing and retailing their products from the health and wellness space. With leading luminaries marking their presence among key speakers (Sachin Duggal, Namrata Purohit, Farah Ali Khan, Neerja Birla, Amrita Raichand, Kanika Kapoor, Grandmaster Akshar, Dr. Namrata Patel, Anand Chulani and the founder herself, Ms. Pooja Duggal) the event further inspired participants on various wellness modules touching their daily lives. The event was also graced by leading Actor and fitness inspiration Sonakshi Sinha who engaged with the audience with a candid one-to-one session on her health mantra and maintaining a wholesome lifestyle vis-à-vis her hectic work schedule. Nine highly engaging workshops aimed at arming the audience with tools to engage in daily wellbeing were also conducted by renowned names such as Nyala Kapadia, Ankita Chawla, Vinita Contractor, Shonali Sabbarwal, Nipa Asharam, Anil Shetty and Devina Badhwar. The Future of Wellness saw active support from renowned corporate entities at various capacities i.e. UFLEX, Keshav Suri Foundation, The Lalit and Engineer.ai. Prominent brands also showcased and retailed their product at special stalls allowing audience to indulge in healthy shopping spree. FOW left a lasting impression on the participants eying to gain meaningful insight on Health and Wellness and plans to advocate the same in coming editions as well. PREVIOUS POST Previous post: Honeywell introduces the 1st ever antibacterial flat switch in India with “Bacti-safe” technology.